In August 2018, Korea's exports of information, communications and technology (ICT) products reached a record high of USD 20.2 billion, surpassing the USD 20 billion mark for the first time since record-keeping began in January 1996. The previous high of USD 19.2 billion was recorded in September 2017. The year-on-year growth rate of ICT exports stood at 15.5 percent in August. The expansion was led by brisk sales of semiconductors and memory chips. 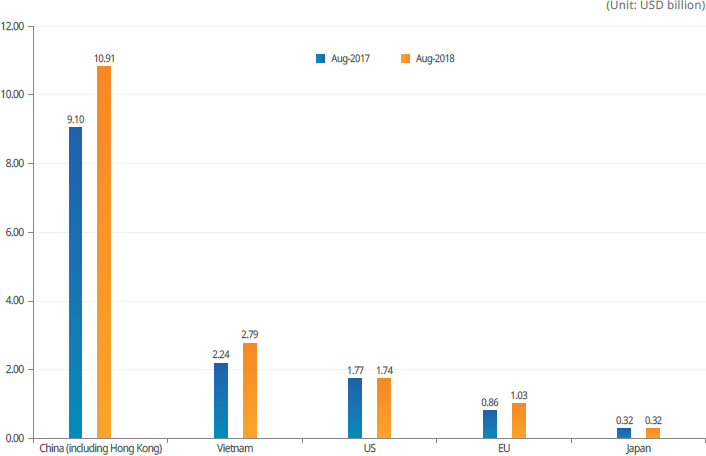 Outbound shipments of semiconductors in August surged by 30.4 percent from a year before to USD 11.6 billion, exceeding USD 10 billion for four months in a row. Display exports went up by 5.8 percent to USD 3 billion due to increased sales of organic light-emitting diodes (OLEDs). Overseas shipments of computers and peripheral devices also grew by 13 percent to USD 977 million. Strong global demand for Korean computers, memory chips and display products offset weak sales of mobile phones. Exports of mobile phones declined by 19.7 percent to USD 1.3 billion amid intensifying competition among high-end mobile phone manufacturers. By region, Korea's ICT exports to the European Union (EU), China and Vietnam shot up while shipments to the United States and Japan dropped. Shipments to China including Hong Kong soared by 20 percent to an all-time high of USD 10.9 billion on the back of upbeat sales of semiconductors, computers and peripherals. ICT exports to the EU continued to grow for ten consecutive months, surging by 19.5 percent to USD 1 billion in August. Shipments of displays and semiconductors to Vietnam increased sharply to USD 1.2 billion and USD 960 million respectively, resulting in a 24.3 percent growth of overall ICT exports to the country. Mobile phone exports to the US fell by 28.7 percent to USD 410 million, bringing the total ICT exports to the country down by 1.4 percent to USD 1.7 billion. Korea saw its ICT exports to Japan inch down to USD 320 million as shipments of mobile phones plunged by 31.3 percent to USD 20 million.